Zenyatta’s filly by War Front was born a few minutes after midnight. Happy Easter to Zenyatta and congratulations to the entire Zenyatta team. 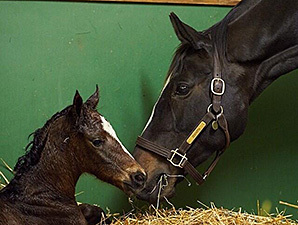 Just a few minutes after midnight, Zenyatta delivered her third foal, a filly by War Front. Mother and filly are reportedly doing well. Isn’t she just the spitting image of her famous mom?